In a week and some change the Air Jordan V 3Lab5 will release. The sneaker gets liberal with the use of the crackled grey print that first appeared on the Air Jordan III back in 1988, almost completely covering the upper with its squiggly lines. The release represents a kind of culmination of borrowings of that “Elephant Print” pattern, one that was for many years exclusive to the model that it debuted on. Is this a tasteful application or are you of the opinion that far too many models these days borrow that Elephant Print pattern from Tinker Hatfield’s 1988 masterpiece? Do you think the overuse of this iconic visual is a sacrilege of sorts, or are you a proponent of Nike giving consumers what they want? 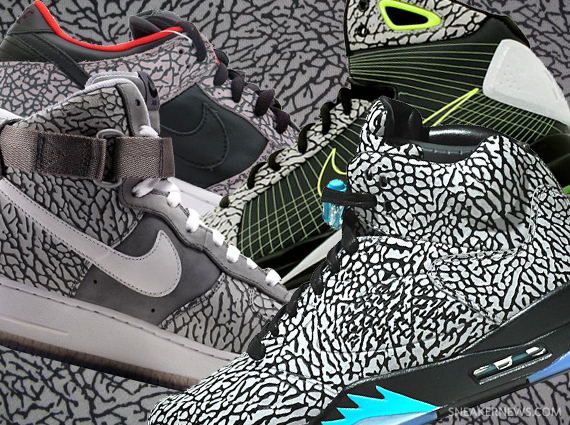 Elephant print on other sneakers is nothing new. Showing the world how a proper appropriation could be pulled off was Supreme’s duo of Nike SB Dunk Low pairs back in 2002. As an obvious homage to the Air Jordan III, the NYC skate shop’s two pairs pulled at that print and some OG color blocking, opening up Pandora’s Box in doing so. Later on down the line Nike did it themselves with shoes like the Air Trainer SC Low and on the “Jordunk” version of the Air Jordan III from 2006, again delivering an obvious tribute to MJ’s third. The various “112” series of releases from DJ Clark Kent also chipped in, as sneakers like the Nike Air Force 1 Low and the Nike Hyperdunk grabbed at the print. On top of that, various models in the NIKEiD range would add the Elephant print to their midst – the Nike Air Force 1 breaking ground on that side of things (Soon after the Nike Air Max 1, Nike Dunk, and Jordan Spiz’ike would have the option available as well). Fast forward to the current day, where the sneaker world is prepping for the release of a retail pair that embraces the print like none other – the Air Jordan 3Lab5. Does the pattern still have special appeal? Or has Nike sampled it a bit too many times in their history? Let us know if you still appreciate elephant print sneakers down in the comments to get the discussion going.